Pregnancy is a special place that women go to, a land where most men (okay all men) are not allowed. That said there are some other critters out there in the animal kingdom who take things up a notch when it comes to pregnancy. I guess I hadn’t really ever thought about it before, but there are quite a few animals whose gestation period goes longer, in a lot of cases MUCH LONGER, than a human’s does. I love sharks and find them fascinating, so I was surprised to learn that many of them have very long pregnancies. In fact, 2 years is not at all uncommon in the shark kingdom. However, one shark in particular takes the award for the most insane pregnancy span in all the world. The Frilled Shark, once pregnant, will remain so for about 3-AND-A-HALF YEARS! I am speechless. I am blown away. 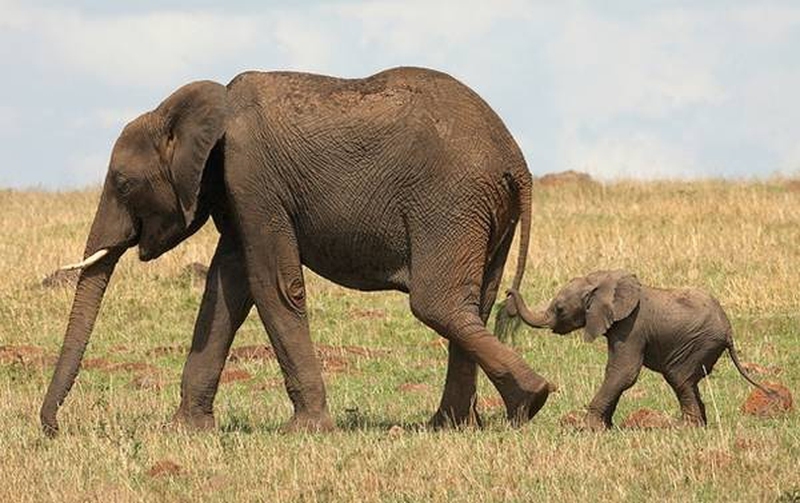 If you are an African Elephant mama and you're pregnant, you will be walking around with a 'little elephant' inside of you for 22 months. That's almost two whole years! I know good things come to those who wait and all, but wow. Harp seals have quite a rough life if you think about it. They live in some of the harshest climates on Earth and are constantly trying to avoid being killed by a variety of predators, one of which is human beings. So, I suspect that mama harps really enjoy the 11-12 months they are pregnant with their babies, since it's the one time they can feel like the kids are safe. It takes about 11-13 months for an alpaca baby to be all set to pop on out into this world. Useless Trivia: I like to think that every alpaca mom gives her sons the cool gangster name, Al Paca. The average giraffe pregnancy takes 15 months. Humans can get pregnant, have a baby, and then get pregnant again in that same amount of time. Whoa. Baby donkeys are born after their mother endures a 12-14 month pregnancy. I wonder if a donkey ever just up and forgot she was even pregnant since the whole process takes so long. Camels stay pregnant for 13-14 months. And then, finally, they get rid of the bump... but not the hump. Killer whales are pregnant with their babies for 17-18 months. That's like a year and a half. My wife would eat me alive. Killer wife. If you are a baby walrus waiting your turn to see the light of the world, you have to wait for 15 months before you can get born. Poor pregnant Mrs Walrus. She must feel like she swallowed a baby rhino. Pregnant tapir moms-to-be have to wait 13 months to meet their little tapirs. Judging by how cute this guy is though, it almost seems worth the really long slog. Dolphins give birth after being pregnant for 11-12 months. That's not much compared to some animals, but it's still quite a bit longer than us humans. Okay, so I'm a real sucker for rhinos. Who isn't? They are pure awesomeness and they remind me of dinosaurs. The very endangered Javan rhino stays pregnant even longer than their Black Rhino cousin. How does being knocked up for 16-19 months sound? Hey, good things take time to make. Mares are typically pregnant for 11-12 months. Imagine carrying a baby horse around inside of you? It must feel like you housed an eighty-pound meatloaf. Server responsed at: 04/18/2019 10:31 p.m.